And log slabs at the ready for final garage trim next weekend. Once peeled, it was a pretty quick job to clean them up, cut to length, and use them to first trim out the garage door (couple weeks ago – we did this with live-edge boards that came with the slab pile), then today, nail up the rounded log slabs to form the corner trim of the garage. A little trompe-l’oeil, it makes each corner appear to actually be a log. In each set, we were able to use a slab that had had a long rip cut on one edge, and a fully rounded slab, mated at the corner. We then planed or chiseled away any extra to round it over, put a line of log caulk down the seam, and voila! Ready for stain the next time we have a good long stretch of warm weather. Before: such a plain-Jane back wall. After (from the road) – log corner! Closer view – the seam will disappear with caulk and stain. Hard to take a photo of the garage, given how crammed it is in the rocks! And in front, live-edge door trim and a log corner. 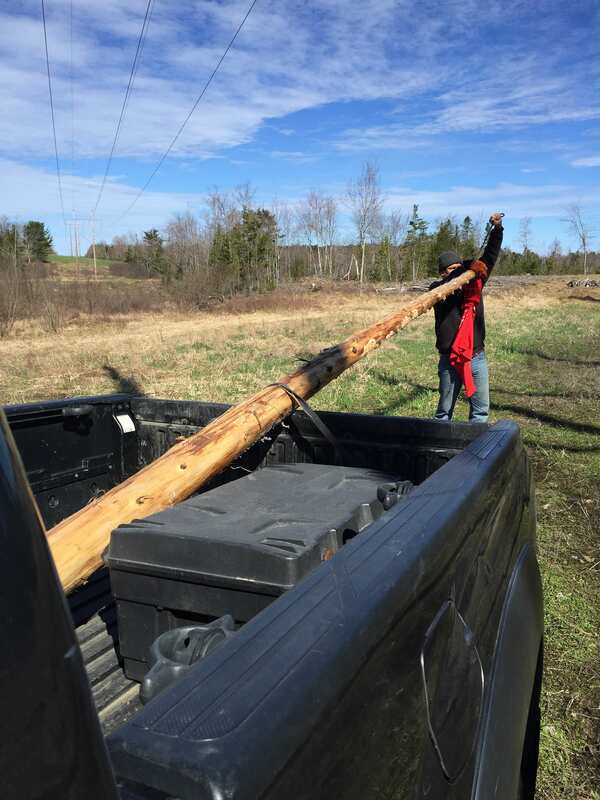 Finally, we went out to the muddy field again where the log guy has a big pile of cedar, and picked up the last long skinny log we’ve been waiting for, to finish up the second stair railing. Project for next week. It warmed up quickly – it was over 70 degrees today! We are turning our attention to finishing some last leftover winter jobs, and planning for summer. In addition to a nice short hike this weekend, we also checked out the lake, started cleaning up the yard, killed two mosquitoes already, picked out a few damaged trees for cutting in the coming weeks, and finished up trim around the interior rafter tie logs – a last area of the ceiling that had a really rough transition with the drywall. After looking at the ugly, jagged holes for a couple of years, I finally figured out how to cover them up: I made leather ‘boots’ custom fit to each one. Inexpensive, forgiving, and it turned out to be a quick job. Much quicker than trying to carve something out of wood or custom creating a metal strap. 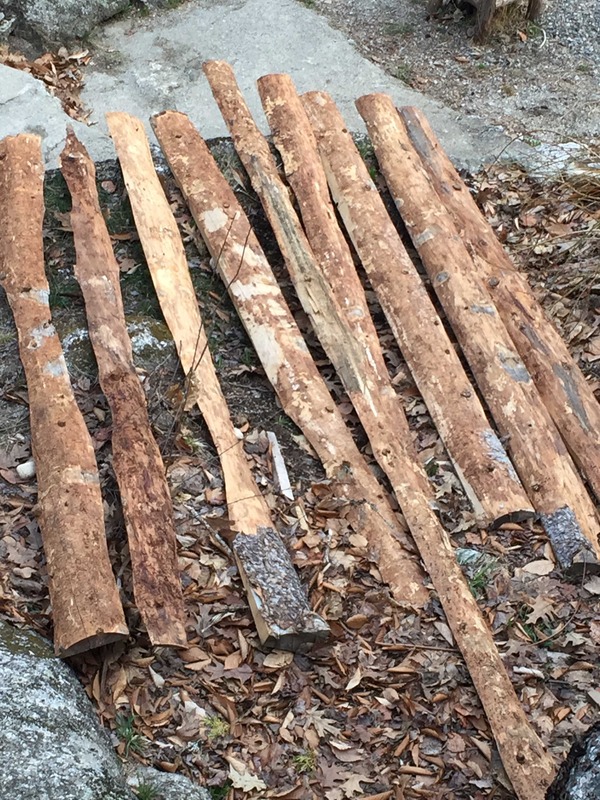 Finally, I got to strip bark off a bunch of log slabs we picked up last fall, that we’ll install on the garage corners to make it look more at home with the cabin. With any luck, we’ll install them next weekend. The goal is to finish up a number of jobs before I go on my summer schedule and have much more time to devote to the big jobs. Obligatory photo of bulbs popping up – who knows what I planted. The ice is out on the lake! But the crud washed down to the end where we have access. Frankie knows how to chill. On my lap. A local engineer’s work. This tree has to come down. Leather trims cover the last gnarly bit of drywall.